Do you know why the chicken was evil? It laid deviled eggs. Could evil look so cute? We are going to poach that breast of chicken in 1 1/2 cups of chicken broth. Cut the chicken into large chunks (about 6 or 7 chunks) and place into a small stock pot. Then pour 1 cup of broth into pot. Place the other 1/2 cup of broth on stove top for later. Place lid over pot. Turn on high heat and allow the broth to come to a boil and hold there for 2 to 3 minutes. Turn heat to low. Simmer and cook the chicken until it is opaque throughout or until the pink is no longer visible, about 10 minutes. You will add the other 1/2 cup of broth half way through the poaching process. Notice in the upper right image the chicken is opaque or no longer pink, now add the other 1/2 cup of chicken broth, doing so with a circular motion. Place lid back over pot. Now lets prepare the other ingredients while we wait for the chicken to cook. If your cream cheese has not softened to room temperature than place it in the microwave for under 45 seconds. 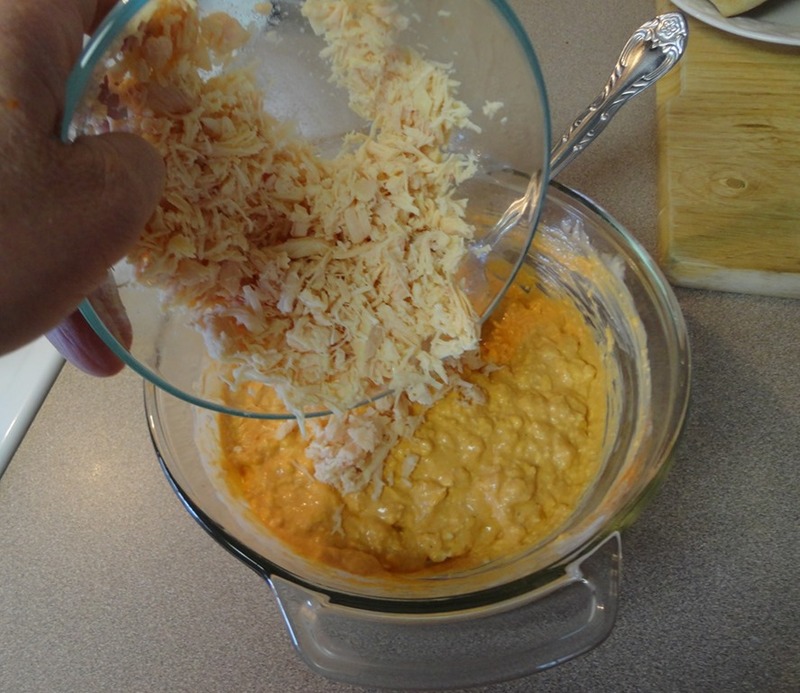 It should only take about 30 seconds to soften the cheese. It will depend on your microwave as to how long you will leave it. Once softened remove from microwave and place into a larger bowl. Using a spatula spread it out and mix in the ranch dressing, Tabasco sauce, mozzarella and goat cheese. Mix all ingredients until well incorporated. Set aside and allow flavors to infuse together. By this time the chicken should be done. Be sure to measure the internal temperature of the chicken. It should be no lower than 165 degrees. 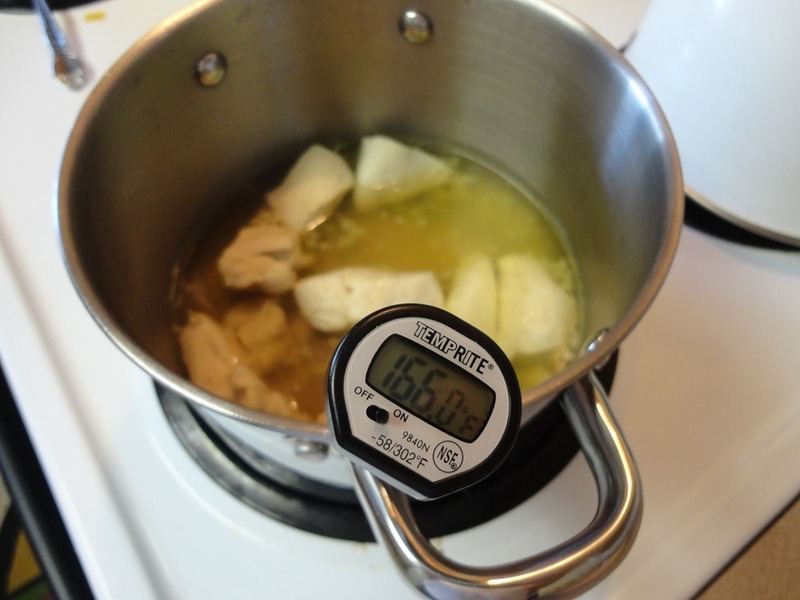 When measuring the temperature, insert the thermometer into a chunk of chicken towards the middle of the stock pot. Insert half way into the chicken chunk, but so it does not come out the other side. You need to read the center of the meat. Wait for at least 2 minutes or until the thermometer comes to a stand still or reaches the temperature and the numbers stop moving. In this image the thermometer is leaning against the side of the stock pot. This was only done so a photo could be taken. The temperature was read first and then a photo was shot for illustration purposes. Do not allow the thermometer to touch the side of the pot. If it has reached 165 degrees or higher, remove chicken from pot and place into a bowl and allow to cool, about 15 to 20 minutes. Once cooled take chicken chunks and shred into pieces. Then mix into cream cheese mixture until well incorporated. The plate is prepared for two. 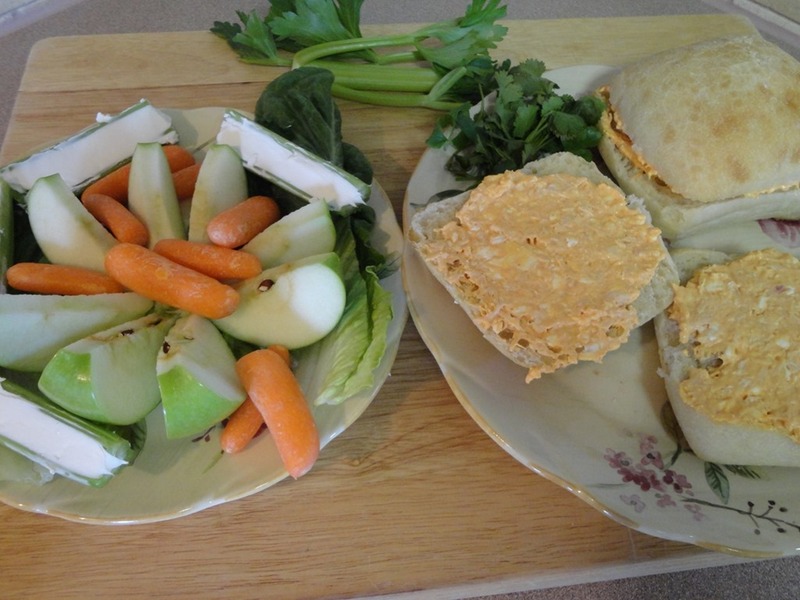 Also there is a plate of celery and cream cheese, baby carrots and apple wedges. If you decide to make this recipe for yourself, I hope you enjoy it as I did. Place cream cheese in microwave less than 45 seconds. It will depend on your microwave as to how long you will leave it. When the cream cheese is softened, remove from microwave and place into a large bowl. Using a spatula spread it out and mix in the ranch dressing, Tabasco sauce, mozzarella and goat cheese. Mix all ingredients until well incorporated. Set aside and allow flavors to infuse together. When chicken has reached 165 degrees internally, remove from pot and place into a bowl and let cool, 15 to 20 minutes. Once cooled take chicken chunks and shred into pieces. Then mix into cream cheese mixture until well incorporated. 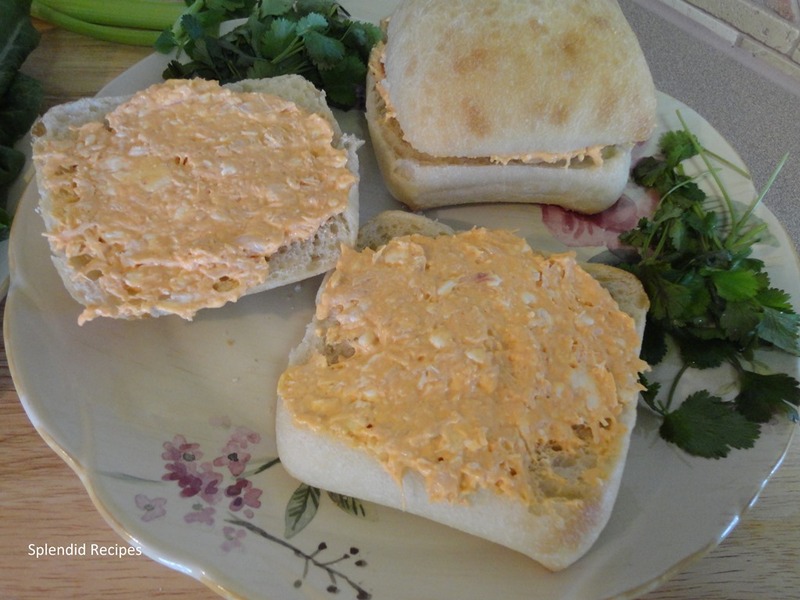 Spread chicken salad on to a Ciabatta Roll or your favorite bread. *Cut the chicken into large chunks (about 6 or 7 chunks) and place into a small stock pot. Then pour 1 cup of chicken broth into pot. Let stand the other 1/2 cup of broth on stove top for later. Place lid over pot. Turn on high heat and allow the broth to come to a boil and hold there for 2 to 3 minutes. Turn heat to low. Simmer and cook the chicken until it is opaque throughout or until the pink is no longer visible, about 10 minutes. You will add the other 1/2 cup of broth half way through the poaching process. 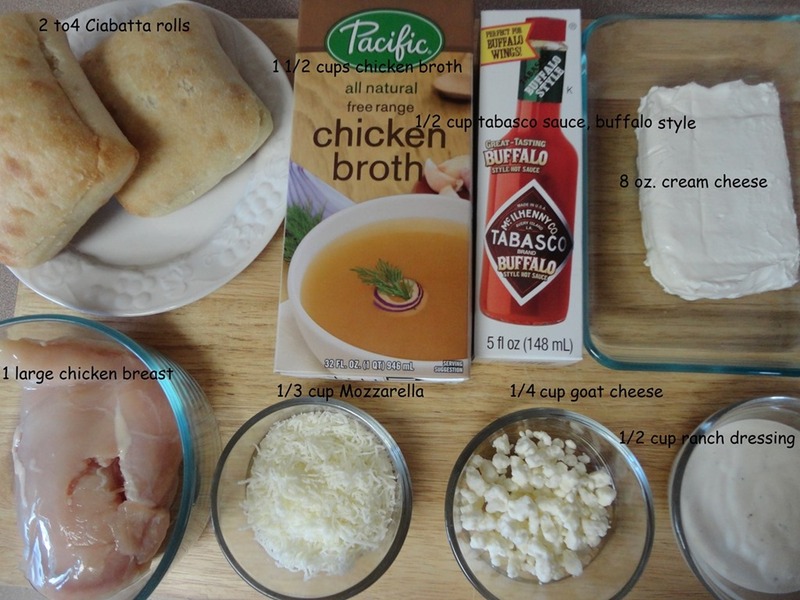 This entry was posted in Main Dish and tagged Barbecue chicken, Broth, Cheese, Chicken, Chicken salad, Ciabatta bread, Cook, Cooking, deviled eggs, Goat cheese, jokes, poaching chicken, Ranch dressing, recipe ideas, Simmer, Stock pot, tabasco sauce. Bookmark the permalink.